Gallery walls contain multitudes. They are many pictures, coming together to form one mega-picture. And they look perfect, but never too perfect. In fact, the best gallery walls look like they were haphazardly thrown together. Like a person happened to have a bunch of differently, yet complimentarily framed photos or art of varying sizes just lying around, and one day they decided to put them all up on the wall without even measuring anything, and it just happened to look amazing. Those are also the kinds of people who have perfectly tousled hair no matter what time of day it is, and who cook complex dishes without following a recipe. I am not one of those people. It’s that kind of effortless, not-trying-that hard, but-actually-trying-very-hard vibe that makes the coveted gallery wall always seem slightly out of reach. Except it’s not out of reach once Framebridge gets involved. Still, it seemed fun to add a gallery wall to our office, where the entire Inventory team could enjoy it. I opted for Framebridge’s The Organic gallery wall design in Modern, “a Scandinavian modern black, white and natural wood collection” of five frames that can supposedly be easily added to over time. For the art itself, I chose from a selection of our favorite Gizmodo Media Group art, because it looks cool, was free to use, and was thematically appropriate for our office wall. In terms of actually sending the art to Framebridge, it was as easy as uploading a file. Using Framebridge’s customization tool, you literally click on a (virtual) frame to add the perfect photo, allowing you to get a sense of how your gallery wall will look once completed before you purchase it. Then Framebridge sends the uploaded art to you, already framed. The whole process was incredibly quick and easy — almost scarily so. Next came the hanging process, and here’s where I need to be upfront with you guys about a snag. I unboxed our Framebridge art, and it look great; I was super happy with how the art looked in the frames, and each was individually wrapped in a few layers of bubble wrap, which seemed warranted and properly executed. However, I was only able to find one (1) nail in the whole box; Framebridge promises to include everything you need to hang, save for a hammer. I swear I scoured that whole box and carefully shook out every single piece of bubble wrap, but there were no more nails to be found. Also not included was the promised “lifesized hanging guide” meant to help me space out my frames. It was on the order form included in the box, but not actually in the box. Normally, an omission like that would really irk me, but even though some crucial parts were missing, I was still impressed by how easy it was to hang up my gallery wall. Nails aren’t necessarily hard to come by; I ended up just bringing in a few that I had lying around at home — they worked fine. I did not, however, have a hammer on hand, so I used a wrench I found in a tool bag in our office supply closet — surprisingly, it also worked fine. As far as figuring out exactly how to position my gallery, I just looked at The Organic product image for reference. I used a pencil to mark the spot where I wanted each frame to be, and whacked the nails into the wall with the wrench accordingly. It turned out stunning, if I do say so myself. In fact, I’m gazing at it from my desk at this very moment; I think I love it more and more every time I glance up at it. Unfortunately, Framebridge’s gallery walls aren’t exactly an impulse buy. The Organic in Modern costs $400, while the White and Mixed Metal options will set you back $350. There are a few more reasonably priced galleries available: The 4-photo Uneven Grid costs $265, The Stack is just $249, and The Mini Square is a mere $149. 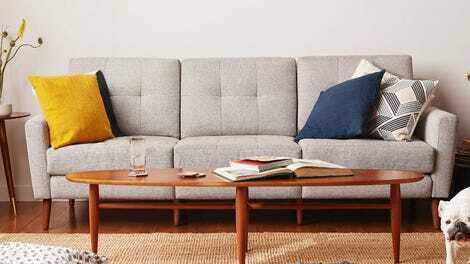 And if you’re really looking to go all out on galleries, there are options to do that, too: The eclectic Wide Organic costs $549, the diagonally oriented Up the Stairs is $849, while the Floor to Ceiling Grid rounds out the top of the range at $1,090. Yes, it’s expensive, but so is having five pieces of art framed individually, just saying. In the end, I’m utterly delighted by how well our office gallery wall came out. 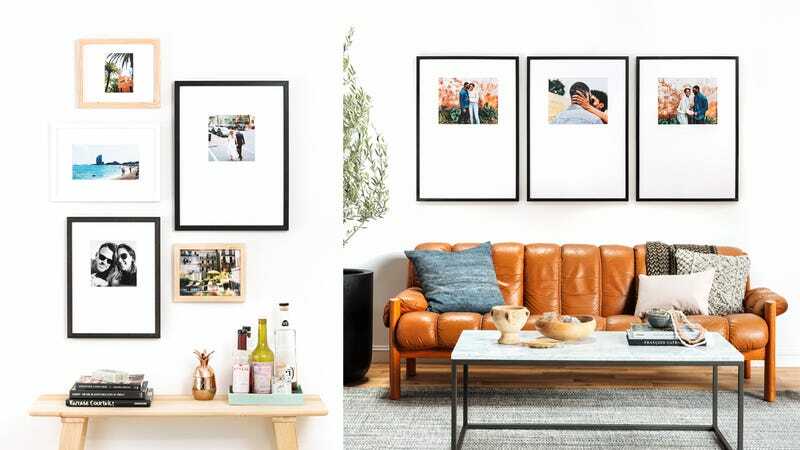 Sure, you could easily buy a bunch of cheap frames on Amazon, shove your photos inside, hang them on your wall, and call it a day. 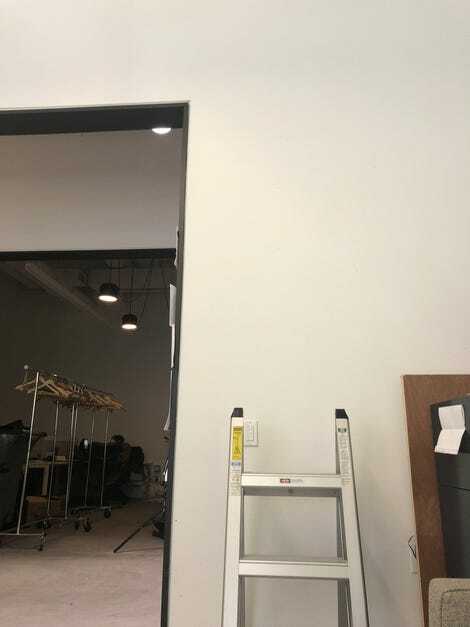 But if the stress of designing a quality gallery wall from scratch is preventing you from even getting started, there’s nothing wrong with letting Framebridge handle the hard parts.